The triple threat of today consisted of the following combination: Monday morning + first frost of the season + (here’s the clincher) 7:00 a.m. cafeteria duty. Oh, but that’s not all. The fruit for the day was ………….oranges. 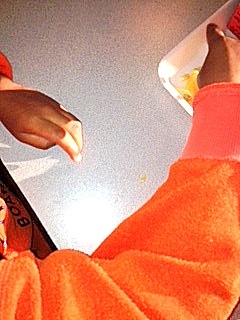 UNpeeled oranges with a cafeteria full of elementary age students who just aren’t that adept at peeling oranges. Oh, and add to that, a five year old student who is really having difficulty acclimating to staying in his seat and not running around the cafeteria at whim. I don’t think I rolled my eyes when I saw the oranges, but I did inwardly think, “Oh great…” I’m embarassed to say that the thought really did cross my mind that it makes absolutely no sense to serve unpeeled oranges to young children who have so not learned to peel them on their own. Yes, that’s what my 7:00 hour looked like. But…sometimes blessings do indeed come in disguise. Because inside of those oranges were …seeds- lots and lots and lots of seeds. And the little guy whose behavior can be a big (huge) distraction to others and has difficulty sitting still in his seat and attending to tasks was totally focused on the mission I had given him to put the seeds in one compartment of the tray. The determination, the focus, the perseverance was quite a wonder to behold in the little one who is most often so easily distracted. Soonafter he had finished his little mission, it was time to go to class and he was on his way. Granted, he may have been a little sticky, but, he was happily on his way. So, once again I see that what I may dread may indeed be a blessing in disguise. I may see the outward stuff and the obstacle (like orange peels and kindergarteners), but never even take into account the unseen things (like the seeds hidden within the orange) and what those unseen things may bring to a situation that could spin it for the good. So, tomorrow morning, as I enter the cafeteria at 7 in the cold, dark, morning, I wonder what fruit they’ll serve the elementary school children at breakfast? Would I choose oranges? Still, a resounding no! But if I do walk in and see a tray full of oranges, hopefully my response won’t be an inward rolling of the eyes, but an outward attempt to use what we have to be all there and enjoy the moment by moment sweet and sometimes sticky adventures that come in the ordinary stuff of life. But, hopefully, tomorrow, they’ll serve bananas, or sliced apples, or grapes.